Esta banda de seis bandas Kaos Krew de Finlandia tomó sus primeros respiros en 2004 como un proyecto de un solo hombre cuando la banda fue fundada por el guitarrista y miembro de la banda Ulf Skog en Jakobstad (Pietarsaari), Finlandia. Más tarde en 2005 Göran Fellman (ex Stormwing), y ahora miembro de la ex-banda de Kaos Krew Tomas Öst fue añadido a la formación (ex Wild Force). El estilo musical de la banda se conoce como Rock / Metal Industrial, aunque la banda ha terminado bajo muchos etiquetados de género de metal durante sus años activos de diferentes revisores alrededor del mundo. Sin embargo, su música es dura y la banda toca lo que se llama "Crossover Metal", que se basa en riffing pesado con la adición de sintetizadores y bucles de la escena Industrial. 18 de septiembre de 2006. También ese álbum fue grabado en Dynamix Studios, masterizado por el ingeniero de sonido Peter In de Betou en Tailor Maid Music Productions en Sunderbyberg, Suecia. Listas de hoy Göran Fellman se unió a la banda en 2005, Él viene antes de la banda Stormwing. A principios de 2010, el baterista Zacharias Ahlvik se unió a la banda como miembro. El vocalista de Kaos Krew Massi Wickman se unió a la banda en 2012. El tecladista Sven Wannäs fue incluido en la alineación en 2013. La formación se completó más tarde en 2014, cuando el bajista Jonas Kuhlberg fue agregado. Hoy la banda es una banda de seis piezas. Durante los años activos de las bandas, la banda se ha mantenido ocupada lanzando 3 álbumes en diferentes etiquetas, un DVD en vivo y dos videos musicales. "Planet Madness" de la canción "Corruption Rules This World" en 2013, "Live at Schauman Hall septiembre 2014" video en 2015, a finales del año 2016 el video a su single "End My Pride" y ahora 2017 la letra Video a su nuevo sencillo "Panamá". Ahora la banda está lista para lanzar otro álbum que ya empezó con la liberación del single "End my Pride" y ahora se sigue con el segundo single "Panama", ambos publicados en formatos digitales. Los singles son pre-lanzamientos para el próximo cuarto álbum de larga duración "Returno" previsto para ser lanzado debido al invierno de 2017. Este será el primer álbum con esta línea actual. Más detalles sobre el próximo álbum de larga duración "Returno" se espera pronto. 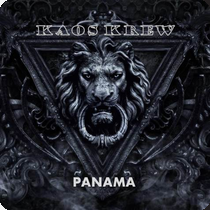 This six-piece band Kaos Krew from Finland took its first breaths in 2004 as a one man’s project when the band was founded by the Guitarist and band member Ulf Skog in Jakobstad (Pietarsaari), Finland. Later on in 2005 Göran Fellman (ex. Stormwing), and now ex.band member of Kaos Krew Tomas Öst was added to the line-up (ex. Wild Force). The band’s music style is known as Industrial Rock/Metal even though the band has ended up under many different metal genre labelling during their active years from different reviewers around the globe. However, their music is hard and the band plays what is called “Crossover Metal” which is based on heavy riffing with the addition of synthesizers and loops from the Industrial scene. September 18, 2006. Also that album was recorded at Dynamix Studios, mastered by sound engineer Peter In de Betou at Tailor Maid Music Productions in Sunderbyberg, Sweden. Todays Line-Up Göran Fellman joined the band in 2005, He comes previous from the band Stormwing. In early 2010 the drummer Zacharias Ahlvik joined the band as a member. Kaos Krew’s vocalist Massi Wickman joined the band in 2012. Keyboardist Sven Wannäs was added to the line-up in 2013. The line-up was completed later on in 2014 when the bassist Jonas Kuhlberg was added. Today the band is a six-piece band. During the bands active years, the band has been keeping themselves busy releasing 3 albums on different labels, one live DVD and two music videos. “Planet Madness” video from the “Corruption Rules This World” album title track in 2013, “Live at Schauman Hall September 2014” video in 2015, end of year 2016 the video to their single “End My Pride” and now 2017 the lyric video to their new single “Panama”. Now the band is ready for another album release that already started out with releasing the single “End my Pride” and now followed-up with second single “Panama”, both released in digital formats. The singles are pre-releases to the upcoming fourth full-length album “Returno” planned to be released due of winter 2017. This will be the very first album with this current line-up. More details on the forthcoming full-length album “Returno” are expected soon.